There are two Catholic communities in China: the “underground”, or unofficial, Church and the official, government-controlled Patriotic Church. 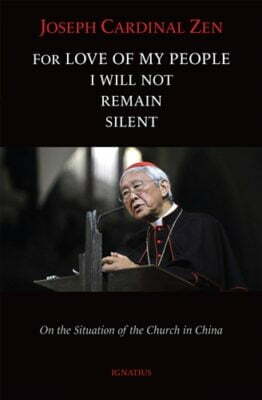 Cardinal Joseph Zen is one of the most knowledgeable and credible witnesses to what is happening in China, especially on the relationship between these two communities. He is a courageous defender of the underground Church yet has intimate knowledge of the official Church, in part because hea taught in several of its seminaries. In these lectures, Cardinal Zen explains in detail what he considers is now threatening the fundamental principles of the letter—and therefore ‘his people’. As the title indicates, for the love of his people, he will not remain silent.